You can’t hide it...from your dog. 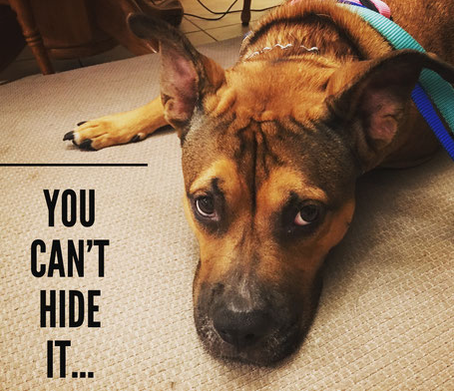 You think you are hiding it from your friends, colleagues, even family, but you aren’t from your dog. You aren’t first challenged by your work, family or obligations. Your first challenge is how you treat yourself and how you talk to yourself and then handle yourself in those work, family and other obligations. In a world with big obligations, big goals, big expectations and a fast paced lifestyle, many of us feel we are falling short or drowning in this sea of expectations and potential. A BIG reason behind that is because of how we talk to ourselves. It is causing a great deal of depression in our society that manifests in many ways. Think about the ups and downs in most of your days, your worst days and your best days. How do you handle them, carry them with you and emotionally dwell on them? What do you say to yourself about yourself? What emotions are you unable to face or deal with properly, efficiently and effectively? Working on your inner dialogue with yourself about yourself can and should take daily work if you struggle with this, as I feel many do. Now look at your dog. You love them dearly and you are putting all of that on them as well. They likely live with you, in your home, having access to everything you are. You come home and wear your emotions on your sleeve, be it disappointment, anger, stress, edginess, crying, AND how you treat yourself, in your head, where you think no one can hear...your dog hears you. You can’t hide anything from your dog. They felt it all. It’s a blessing and a curse for your pup to have all of this access to you. So the next time you are about to put yourself down, make excuses for your life through anger, tell yourself it’s not your fault OR tell yourself you’re not worth it, think of how that is affecting your dog, your relationship with your dog and the ability to have freedom and balance with your dog. I can tell you from experience that you may not even see the ramifications of it, but they are there. Stop making excuses one day and putting yourself down the next. Work on you, your gratitude, your accountability, discipline in your life and loving yourself. You will be amazed at how your relationship with your animals, family and friends will improve and most importantly, improve your life and how you live it and how you think about yourself. I am not saying we don’t all have moments or that you aren’t allowed to have moments, but a repetition of levels of self doubt mixed with blaming and being highly emotional makes it near impossible to enjoy your life with your dog who does not rationalize or understand. They simply feed off of it in some way. This might sound silly to some of you, but I personally struggled with some extreme teenager and early 20’s identity angst and it affected my dog severely. When I started to see that, I made a daily effort to control myself when working with her. That absolutely helped me in other areas of my life and I will always be grateful to her for that. I couldn’t do it for me, but I could put effort in it for her. It was the tiniest little beginner baby step that led me to where I am now 12 years later. I was actually making her mess of genetics worse and destroying any coping skills she could have had at the time. This isn’t to say some very level headed dogs can’t deal with anything and not care and be fine...but dogs are VERY emotionally diverse. So I ask you...how might you be affecting your dog, because you can’t hide the truth.